How our ideals play into our social media presence. This is something that you hear often, if not all the time, as members of our great organization. But did you know that this reference also pertains to social media? Social media is a growing presence. Actually, that is quite an understatement, what with Facebook, Twitter, Instagram, and many others at our fingertips anytime we want through smart devices. This is both a blessing and a curse. Just with email or any written word that can easily be misinterpreted, posts on social media can easily be misinterpreted. Additionally, the ability to post status updates or pictures at any moment can often lead to posting of updates when upset, when under the influence, or out of spite or angry. Here are some examples of posts on social media that represent some common issues. You are upset that not many people in your chapter helped with a car wash fundraiser. You’re so upset you decide to rant about it on Facebook. It may not be pointed at anyone in particular, but it definitely mentions TBS and refers to your chapter. You don’t think anything of it until you receive a call from your chapter President. It may not have been your intention to upset your chapter, but you did. Can you see how this post was inappropriate? As Sisters we need to think how our posts on social media reflect on our chapters. Although you love your chapter and Sisters, this now casts a shadow on your chapter and the members – even if all your other posts before and from now on are positive. This post did not reflect cultivation and maintenance of your emotional poise under all conditions or a cheerfulness at all times and under all circumstances, even in the face of great trial. Now this doesn’t mean that you cannot get upset or you cannot post on Facebook or any other social media outlet. However, as we are constantly representing not only our chapter, our band programs, or schools, and Tau Beta Sigma as a whole, we need to think critically about how our actions on social media reflect on these various entities and most of all, how they reflect on ourselves as individuals. You are weeks away from graduation and decide to celebrate by going out drinking with some friends. You don’t think much of it until you start scanning through the photos that you were tagged in on Instagram the next morning. There are pictures of you obviously inebriated, and some are of you in somewhat compromising positions with other individuals. You are not too worried as you are of age and have the right to have a good time, although some pictures do make you slightly uncomfortable. Can you see how these posts can be inappropriate? Do you think your actions, or at least what is portrayed in these pictures, is a good reflection of you as a person? Do they demonstrate appreciation for and the maintenance of the highest moral standards? Another thing to think about is what do you think future employers would think if they saw these pictures. One thing that we often forget is that once posted online, pictures and statuses are there forever, regardless whether or not you delete them. We should always be very aware of how we are represented on social media, as you never know who will be reviewing your profiles in the future. You are creating a slideshow that has examples of hazing. You have some Sisters help you out. You blindfold them and stick them in the back of your car as an example of something that would be considered hazing. You start taking pictures for the slideshow, and then share a couple of the photos with the Sisters who participated. Unbeknownst to you, one of them posts them online. Days later your chapter is notified that they have been placed on Administrative Hold on allegations of hazing. This is an example of something rather innocent that can be interpreted wrong. When a picture is posted online that may constitute a risk management issue, even if it was a joke, prank, or taken out of context, it can lead to many issues. 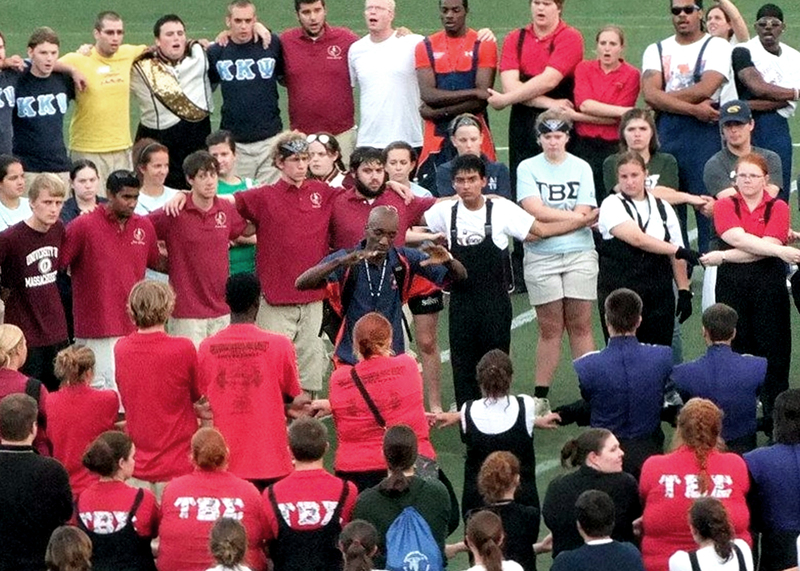 Unfortunately, things like this do happen, and they result in distress for not only the chapter, but for the band program which will be without service from the chapter, and Tau Beta Sigma as a whole. Social media can and should be a positive experience for all. However, we need to remember that, just like email, status updates and photos can be interpreted many different ways depending on who is reading or viewing what you post. While you may think your posts are carefree or simple, or even a joke, that may not be how your friends or family members interpret it. We need to be wary about how we are portrayed on social media. Not only about how posts or photos may reflect on our organization, your band program, or school, but also how it reflects on you as an individual. Just as we ask members whether or not they would be happy with their parents or grandparents participating in an event that may be a risk management issue, you must ask yourself the same question when you post on social media. Do all you do For Greater Bands! Which Pillar is Most Important: Music, Sisterhood, or Service? Previous story Your Fall 2014 Podium Has Arrived!